We attended our local Parents as Teachers arts and crafts night with Santa this year. They had several cute and easy Christmas crafts for kids. The theme was The Polar Express. They had a train table with the polar express train. The kids got to make a polar express ticket craft and a snowman print and (my favorite) a conductor's lantern. The kids also got to make a gingerbread house and visit with Santa. Santa came around to all of the tables and admired the kids crafts, which made the boys feel so proud! 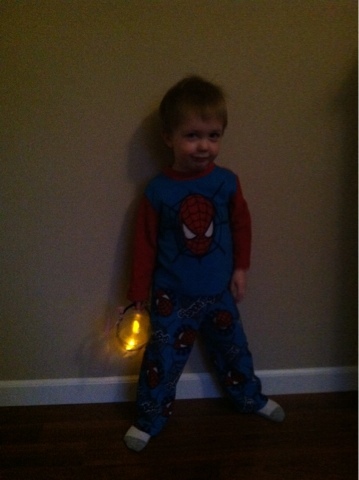 The Conductor's lanterns were super easy to put together and came with a great take home activity as well. All you need for these lanterns are a dome shaped plastic cup (like the McCafe cups at McDonalds), a battery operated candle-- tea light size, pipe cleaners (chenille stem), and a decorative piece of ribbon . Decorate the tea light candle with some pipe cleaners and drop into the plastic cup. Put the lid on the cup. Fahion the pipe cleaners into a handle. Tie the ribbon on the handle. You do have to take the lid off every time you want to turn the lantern on and off. The parent educators had also created a wonderful take home activity to go with this craft. They had printed out a ticket for each parent to give their child. It promised each kid an opportunity to stay up late and go out for a car ride in the dark with his lantern. The family was supposed to drive around and look at lights together and come home for a special snack. 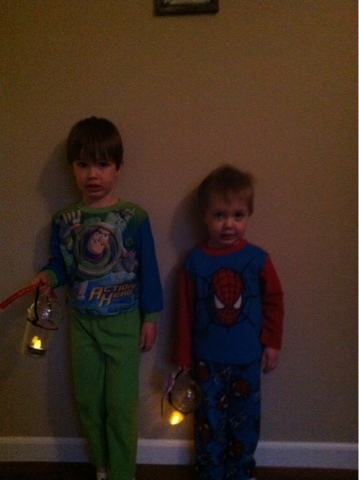 The boys enjoyed their night out with their lanterns. They even wore their pajamas like the kids on the Polar Express. Each year I share this book with the boys in the days leading up to the holiday and we share fun activities to go with it. Last year we invited some friends to join us on The Polar Express with our Polar Express playdate. If you are looking for more Christmas books for kids or Christmas activities for kids, check out my page of Books and Activities by Holiday. Polar Express is certainly a wonderful book! Cute craft and activity to go with it! Oh, excellent ideas! What a nice pre-school and parent group! I have to tuck this idea away.